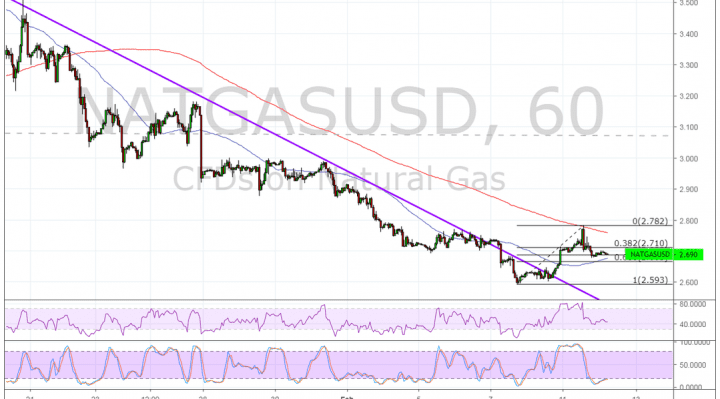 Natural gas recently broke out of its descending trend line to indicate that a reversal from the slide is in the works. Price hit a short-term roadblock around $2.800 so it might need a quick correction to gather more bullish pressure. Applying the Fibonacci retracement tool on the latest swing low and high shows that the 61.8% level is close to the broken trend line and 100 SMA dynamic inflection point. On the subject of moving averages, the 100 SMA is below the longer-term 200 SMA to indicate that the path of least resistance is to the downside. This means that the selloff is more likely to gain traction than to reverse. Then again, the gap between the moving averages is narrowing to reflect slower selling pressure. Still, natural gas is trading below the 200 SMA dynamic inflection point which recently held as resistance to indicate that there’s some bearish momentum in play. RSI is also heading lower so price might follow suit while sellers have the upper hand. The oscillator has some room to go before hitting the oversold region, so sellers could stay on top for a bit longer. Stochastic is already in the oversold region to indicate that bears are exhausted. This oscillator is starting to turn higher to signal that bullish momentum is returning. Natural gas enjoyed a big rally once again due to forecasts for a colder weekend. These scenarios usually spur a strong demand for heating commodities, thereby easing some of the oversupply in inventories. Some forecasts predict that this could be the case throughout March, which suggests demand might be elevated in the weeks ahead. Overall market sentiment also plays a role in determining whether or not the rally can be sustained. Trade talks might be a major factor as escalating tensions could weigh on riskier assets like commodities.